Explore your Sound Damping Panel design possibilities without the commitment. With over a thousand fabric options, custom sizing, and the ability to print any high-resolution image on an Audimute Sound Damping Panel, we’re sure to have the sound solution for your needs – and the sound dampening sample packs to test them out! 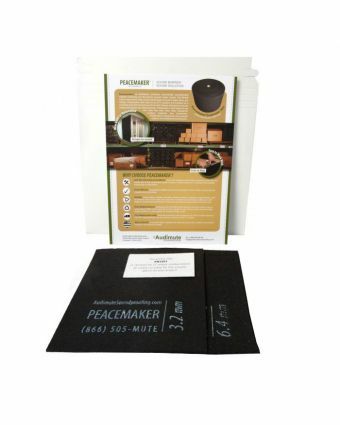 Ordering a free ship sample pack is a risk-free way to learn more about Audimute sound damping panels. 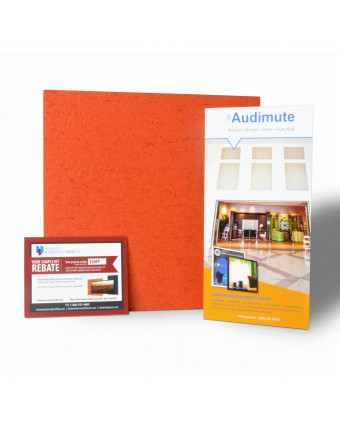 Each sample pack includes a rebate equal to the cost of the sample pack and applicable to your first panel order. Fabric Sample Pack - includes standard and designer fabric swatches, an illustrated informational brochure, and a $10 rebate on your next order. 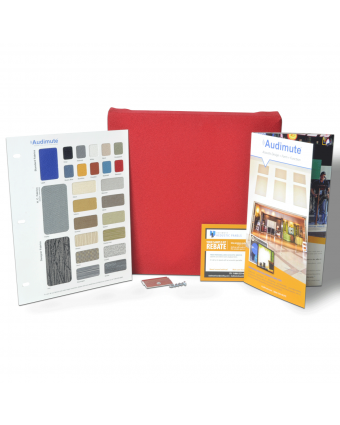 Standard Sound Damping Panels Sample Pack - includes a 1' x 1' sample panel in one of our standard fabric colors, mounting hardware, standard and designer fabric swatches, an illustrated informational brochure, and a $20 rebate on your next order. 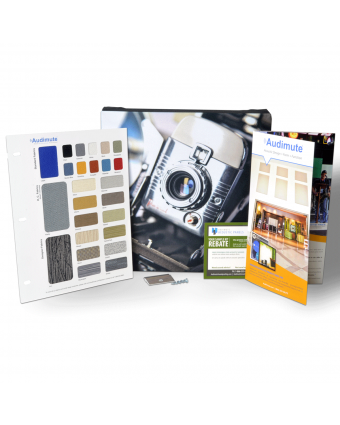 Image Panel Sample Pack - includes a 1' x 1' sample image panel, mounting hardware, standard and designer fabric swatches, an illustrated informational brochure, and a $30 rebate on your next order. 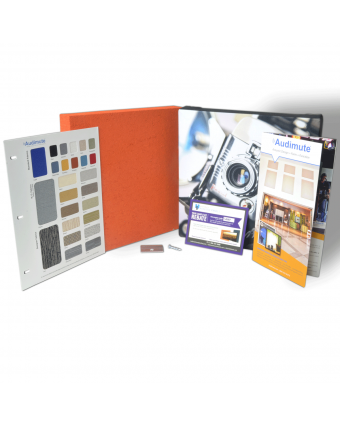 Deluxe Sound Dampening Panels Sample Pack - includes a 1' x 1' sample image panel, a 1' x 1' sample of raw eco-C-tex, with both coated and uncoated sides, mounting hardware, standard and designer fabric swatches, an illustrated informational brochure, and a $35 rebate on your next order. EFFECTIVE: Audimute's Sound Damping Panels are the perfect solution for many noise problems. Adding sound damping panels to the room will reduce reflected sound thereby dampening the echo and reverberation, creating a terrific acoustic environment. In properly treated spaces, Audimute sound dampening panels reduce volume levels by as much as 100%. ENVIRONMENTALLY FRIENDLY: Audimute sound absorbing panels feature eco-C-tex, the GREENEST sound absorbing material on the market. Learn more about eco-C-tex™ inside your sound dampening panel sample packs! FULLY CUSTOMIZABLE: Our sound absorbing panels are available in a variety of shapes, sizes and colors. Sound damping panels can also be ordered with custom printed art - choose one of our stock images or provide your own image, photo or logo. Order multiple sample packs and compare. HIGH QUALITY: Audimute Sound Damping Panels are handmade in the USA, and offer superior performance for wall and ceiling applications. SUITABLE FOR ANY APPLICATION: Simply install sound damping panels where low and mid frequency absorption is desired. Applications include: conference rooms, home soundproofing, libraries, restaurants, exhibition halls, classrooms, retail, family rooms and more. Every sample pack ships free, is in stock, and is ready to ship. Click the image below to make your selection or call us today at 866-505-6883 to place your order!